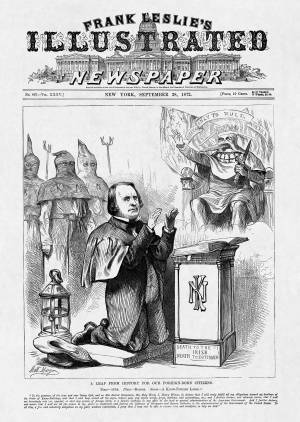 In the turbulent political circumstances of the mid-1850s, the nativist (see "Nativism" in Issues) American party sometimes served as a way station between the crumbling Whig party and the emerging Republican party for those who considered slavery and Catholicism to be evils that threatened the nation. Such was the case for Senator Henry Wilson of Massachusetts, the Republican vice-presidential nominee in 1872. In this cartoon, his previous membership in the American party has come back to haunt him nearly 20 years later. The cartoonist's intention is to foster ill will for Wilson among the numerous Irish-American and German-American ("Dutchmen") voters. Furthermore, the hooded costumes of the Know-Nothings evoke images of the Ku Klux Klan as well as goad traditional American hostility toward secret societies, like the Masons.